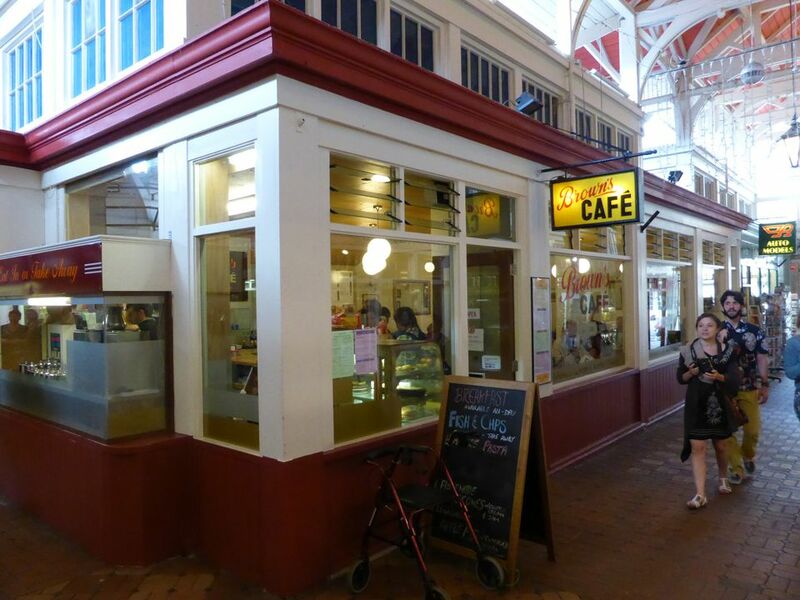 Brown's Café in Oxford Covered Market is the kind of local secret that everybody knows about. For decades students, locals, professors, and tourists have been rubbing shoulders in this unpretentious, typical English "caff" - nevermind that it's been run for years by a Portuguese family. They come to fill up on cheap, homey comfort food, made well and served with friendly dignity. The decor looks as though it has been there since before the flood -- wood-paneled walls painted pale cream, sometimes decorated with dusty bunches of plastic flowers and checked vinyl tablecloths on some of the wobbly tables. But looks aren't everything. I ate lunch beside an Oxford professor who had been a regular as a student, 27 years earlier. Today, her daughter was tucking into a huge slab of apple pie, smothered in yellow custard sauce - one of the café's standout favorites. Around us university students and teachers, tourists, secretaries, shop clerks, truck drivers and market traders devoured such traditional English fare as shepherd's pie, stuffed jacket potatoes, liver and onions, haddock and chips, plus sandwiches and burgers -- none of it costing much more than a fiver and all of it homemade by the family owners. By the way, don't confuse this Brown's Café with the bistro and cocktail bar across from St. Giles church, also called Browns. That one is half a mile away in distance and a million miles away in style. What the British call nursery food is the kind of uncomplicated, familiar food most of them ate as children and remember with nostalgia. This is the sort of place where you can indulge - and you'd be hard pressed to spend much more than £15 even if you chose three courses of the most expensive items on the menu. There's a vegetarian breakfast, cheesy omelettes, and stuffed baked potatoes, but otherwise, choices for vegetarians are limited. Occasionally Portuguese sweet eggy pastries are available. Buy them if they're on when you visit - they are homemade and delicious. It's always busy and bustling but table turnover is fast. Go early for lunch if you don't like to wait. They still make their tea in a big, old-fashioned tea kettle - with real tea leaves. The Bottom Line: It may not look as beautiful as it might, but it's fast, familiar, filling and tasty. This is a handy place to know about when visiting Oxford.